Save on your bottom line with Consolidated’s used container pickup, transportation and reconditioning programs. All containers go through: inspection, decontamination, cleaning, restoring, assembly, tracking, testing and finishing. Consolidated is dependent on an integrated program connecting suppliers and the end users. We offer a wide variety of reconditioned products consisting of Openhead and Closedhead drums with a choice of lid type and ring style for both UN/DOT packaging as well as Non-regulated applications. Consolidated rebuilds used steel drums into refinished drums that look and perform as if they were new but at a much lower cost. Empty containers are received by various means of transportation from common carriers or our private fleet of trucks and trailers. As required by EPA and DOT regulations, all containers must be prepared for shipment as if they contained their original contents; with all fittings, closures, rings, lids and labels in place. 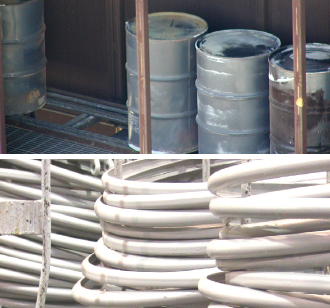 Empty containers are disassembled and processed in an Approved Drum reclamation furnace. The steel drums are then cleaned by shot blasting preparing the surface for repainting. Drums considered non-reusable are recycled as scrap steel. Steel drums are then re-shaped using a variety of specialized metal working machines to restore the physical condition of the drum to meet its original specifications. Before painting, the drum body is put together with the appropriate lid, ring and/or bung and plug fittings as requested. After surface preparation and repair, steel drums are painted according to your specifications. A protective coating is applied to the drum exterior, and if required a chemically resistant or food grade lining may be applied to the drum interior. USDOT and UN required labels and/or stencils are applied, and the drums are staged for shipping. Reconditioning is a vital step in extending demand for use. As part of our sustainable management philosophy, we believe a strong focus on incorporating recovery, recycling and reuse in everythingwe do. 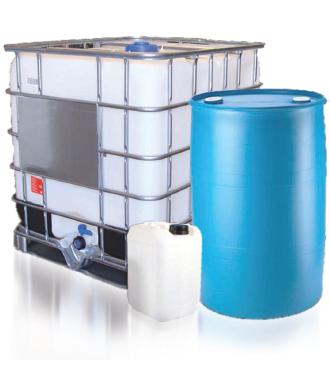 Empty plastic drums and IBCs are cleaned with high pressure hot water with a mild surfactant. Wash water from this process is reused to the greatest extent possible to minimize wastewater generation. 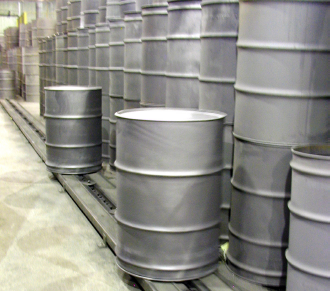 Drums and IBC's are leaktested in accordance with the Code of Federal Regulations. Any plastic material not meeting the reuse criteria is ground up for recycling. Reconditioned containers are prepared for shipment and are distributed from our facilities to you. Empty Container Certification is a written document. It confirms that the containers being transferred are actually empty, in accordance with the EPA definition of empty containers, and that they have been properly prepared for transportation. Some certification is executed on a contractual basis, but commonly printed on and signed for on the receiving ticket each time containers are picked up. Retaining labels is required by regulation. Labels needed to communicate to all essential safety information until the containers are cleaned or processed for scrap recycling. Labels should never be removed or painted over. All openings including removable heads, filling and vent holes must be tightly closed prior to shipment. Closed head drums must have all plugs reinserted and tightened, and open head drums must have the covers and locking rings refastened. Nearly all major industrialized nations including the United States have replaced their individual, domes­tic hazardous materials regulations to comply with the United Nations Recommendations. 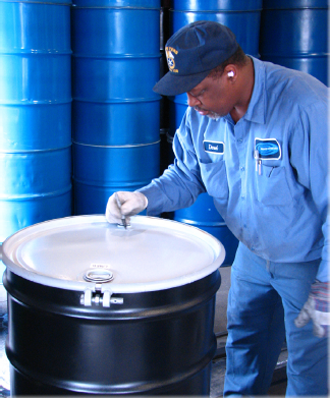 To determine the correct drum markings for the product you are shipping, you must at least know the following information about hazardous materials. (A) Determine the Packing Group of the material. Hazardous materials are categorized in Packing Groups ranging from I - III, with I being the most hazardous. (B) For solids, drums are authorized to carry a specific gross mass in kilograms (Kg), so you must know the mass (i.e., the weight of the material) you will be shipping. (C) To ship liquids you must know the vapor pressure at either 50 or 55 degrees Celsius and the specific gravity. The worksheet below may assist you in determining the marking you require. Shippers of hazardous materials that use non-bulk or intermediate bulk packaging are re­quired to use UN marked packaging. We use a durable mark (e.g., stenciling) to indicate the UN standard the drum meets. The full durable mark (minus thickness) is generally labeled on the side of a drum. If your non-bulk container have been converted from a closed head to an open head drum or remanufactured, a permanent mark (e.g., emboss) is on the side of the drum. If a tight head drum has been remanufactured, a UN durable mark may is placed on the side.